Figures to populate our models are always welcome, and even moreso when we have a variety of options with them. This set from Master Box is well done and fits the bill. 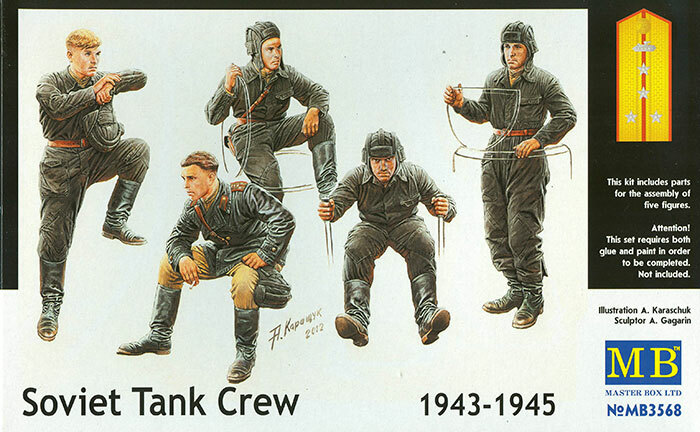 The kit provides for five figures of late war Soviet tank crews. There is a driver-mechanic at his controls, a loader sitting on a turret in an open hatch, a commander in his hatch, another tanker with his foot resting on an object, and a company/battalion commander seated and smoking a cigarette. All except the unit commander are wearing the black cloth coveralls; that figure has the khaki uniform with black leather coat. Each figure comes in six basic parts (head, torso, legs and arms) and the ones with the tanker’s helmets are also provided a three-piece helmet (crown and separate ear flaps). The tank commander may be posed two different ways with an extra left arm. Box art is by A. Karashchuk and is nicely done, but that is also it for your painting directions. A color chart is included but is keyed to only Valejo and Lifecolor paints. Overall this is a nice set and more options are always good. Master Box is located in Dnepropetrovsk which is in the eastern Ukraine, the same area of the county where trouble has arisen. There is no way of telling if this will upset distribution of their kits or not.